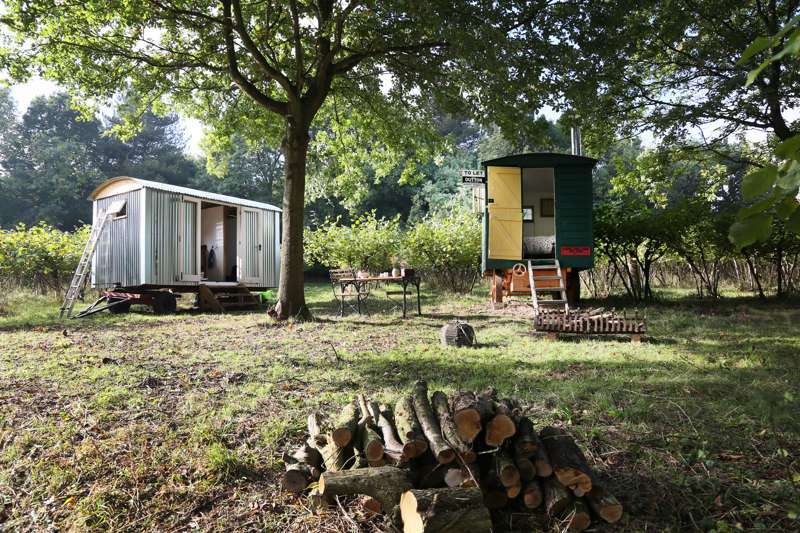 A pair of brand new luxury yurts and a shepherds hut in a Kentish meadow on Bore Place Organic dairy farm. 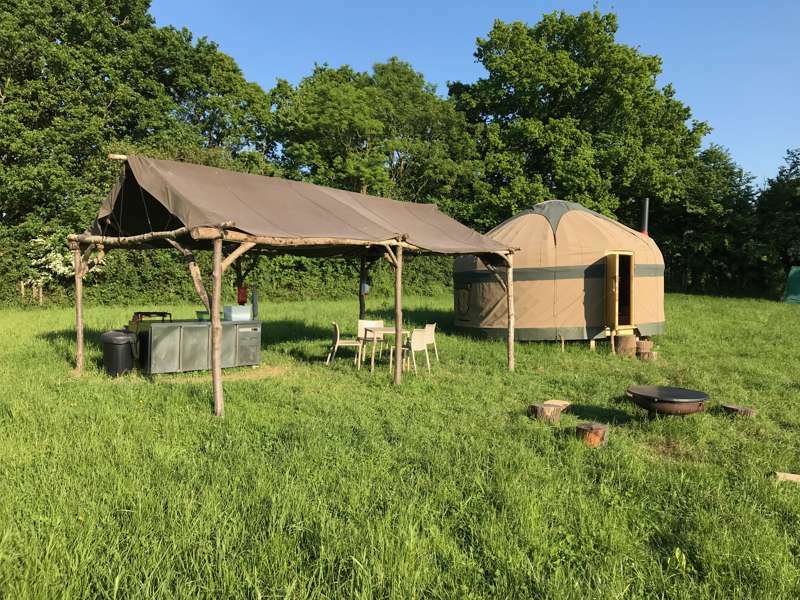 We started life in 2017 and our first luxury yurt proved such a huge hit that we invested in another one! 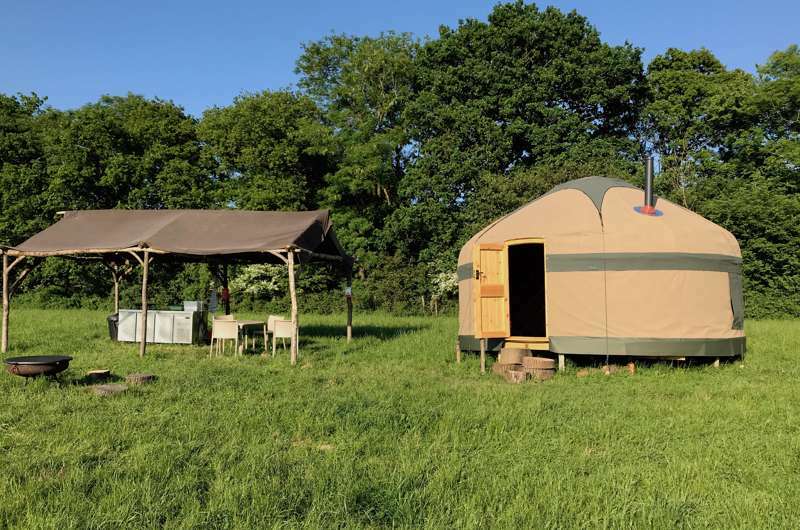 We love being out in nature, but we also love comfy beds, kitchen facilities, and wood-burning stoves, so we feel Free Range Glamping offers the best of both worlds – rustic luxury meets a true outdoors experience. Our rural Kent Downs setting is such a beautifully special place – we hope you love it as much as we do. We invite you to play in the woods, sit round the fire and explore the farm. Bore Place operates as an environmental charity in the weald of Kent. An amazing creative place, with lots going on, and yet a real stillness about it. Guests are welcome to take part in our ecology courses, woodcraft and guided walks. 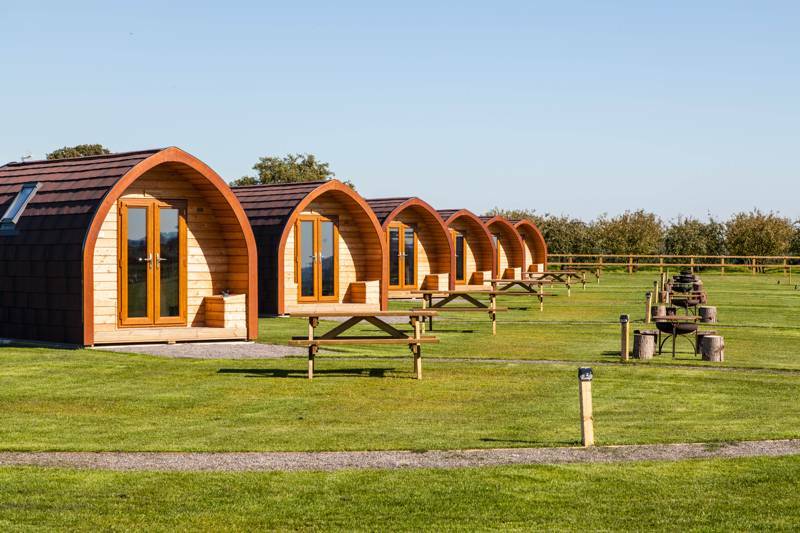 For latest availability and best prices for Free Range Glamping, please use the Date Search above. 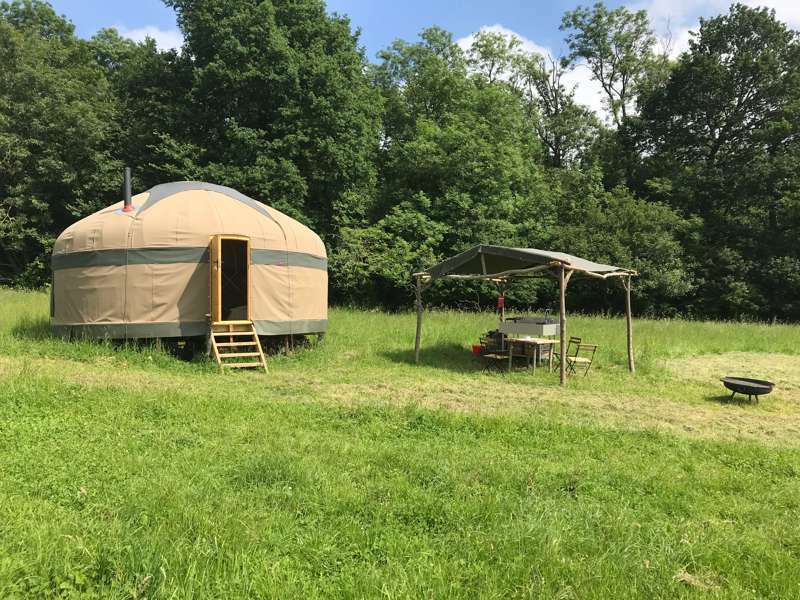 Each yurt comes with a proper kingsize double bed and a futon style sofa bed. The shepherds hut has a lovely kingsize double too. A wood-burning stove, with starter pack of wood and kindling, and linen (towels, sheets, pillows and duvets) are all provided. Each yurt has its own private outdoor kitchen shelter featuring gas hob, food prep area and outdoor seating and table. The shepherds hut has an indoor kitchen with gas hob and sink, as well as outdoor seating. There's also a firepit/BBQ. The yurt's have a private composting toilet, and the shepherds hut an indoor one. There's a standard flushing toilet, hot shower and baby-changing facilities at the farm about 300m away. Famed as the 'Garden of England', Kent is bursting with bucolic attractions with many in the immediate vicinity of Edenbridge including Emmets Garden (01732 868381), Penshurst Place and Gardens (01892 870307) and Riverhill Himalayan Gardens (01732 459777). For history buffs, Winston Churchill's old countryside retreat Chartwell (01732 868381) makes for a fascinating away-day. The stunning grounds and National Trust-run house are filled with various historic artefacts including the former prime minister's very own paintings. Chiddingstone village itself (also owned by the National Trust) is described as the most perfect surviving example of a one-street Tudor village anywhere in the county. Elsewhere, art-filled Chiddingstone Castle (01892 870347) , motte and bailey Tonbridge Castle (01732 770929) and childhood home of Anne Boleyn Hever Castle and Gardens (01732 865224) all offer tours and regular events. Back at the site, Bore Place (01732 463255) itself offers a wealth of walks woodcraft workshops and courses in sustainability, organic agriculture, horticulture, health and wellbeing courses. For the best coffee around – and outstanding views of Bough Beech Reservoir – Ide Hill Community Shop (01732 750157) ,about a mile north of the yurt, is the place to go. Groombridge Farm Shop (01892 861753) boasts the finest Kentish produce – be sure to stock up on their famous asparagus. Cafe-wise, the beautiful Kingdom centre set in the Penshurst woods offers delicious healthy whole food dishes and great coffee in a lovely setting. It's open every day 10am – 5pm. There's plenty of nice pubs just a short drive away. The King Henry VIII (01732 862457) – a charming half-timbered Tudor pile – is the nearest (about 10 mins). They serve a fine selection of ales and a surprisingly varied menu of curries and pasta alongside pub grub classics. The Little Brown Jug (01892 870318) in Chiddingstone Causeway is a popular gastropub, a pleasant hour or so's walk away. The Castle in at Chiddingstone (01892 870371) is another handsome watering hole that's equally walkable and does good food. For a refined dining experience, The Wheatsheaf (01732 700100) in Bough Beech offers beautifully presented dishes, with much of the produce coming direct from this modern gastro's very own kitchen garden. You'll find supermarkets in Edenbridge, Sevenoaks and Tonbridge and Chiddingstone Causeway has a well-stocked village shop. Satnav users should enter TN8 7AR. Otherwise, leave the M25 at junction 5 and join the A21 south to Sevenoaks. Leave the A21 at the exit signed for Sevenoaks A225/Hildenborough, then take the second exit onto the B245 towards Hildenborough and Tonbridge. Continue onto B245 for 2 miles, then turn right (signposted for Leigh/Chiddingstone). Continue straight until you reach a T junction, then turn right onto the B2027 (signposted Edenbridge). Continue straight along the B2027, through Leigh and Chiddingstone Causeway. After the village shop and post office in Chiddingstone Causeway, take the third turning on the right (signposted ‘Bore Place’). Travel along the avenue of trees. At the first junction, the road narrows. Go straight on, then take the first turning left into the Bore Placer drive (signposted ‘Bore Place only’). The nearest mainline railway stations are Penshurst – 4 miles away (55 mins to Victoria, weekdays only); Sevenoaks Sevenoaks – 6 miles away (25 mins to London Bridge); and Tonbridge – 8 miles away (40 mins to London Bridge). 2 yurts (each sleeping 4).